This month’s challenge was Touch of Gold! Gold embellishments and accents are huge in fashion, home decor and paper crafting so we were challenged to add some to our project. Ever have an idea on your head and the resulting card doesn’t end up quite as impressive? This is that card for me. Especially since the embossing doesn’t show up as shiny and pretty as it does IRL. and neither does the fact that the ivory hexagons are raised up on foam dots. (the ones NOT under the sentiment anyway) But, I still think it looks pretty nice! I hope you like it too; kind of a quilt look. The ivory hexagons with gold on half of them were swiped in Versamark then heated with gold EP. I deliberately didn’t tap of all the excess EP then heated from the bottom for a messy look. I used the same technique on the edges of the cover plate die. Thanks for visiting. If you are new to my blog, I hope you will come by again! Feel free to sign up as a follower or by email subscription and I’d be thrilled if you’d leave a comment. Have fun on the blog hop! Just laughing to myself, cuz I know exactly how you feel about photos! Love those raised ivory hexagons with the bees, they accent perfectly! I think this card is fabulous (but I can totally relate to the feeling of just not being quite pleased with the end result). You added so many great details to this card…I can't imagine the time you put into it. Don't you hate how sometimes we can't capture how a card looks in real life? 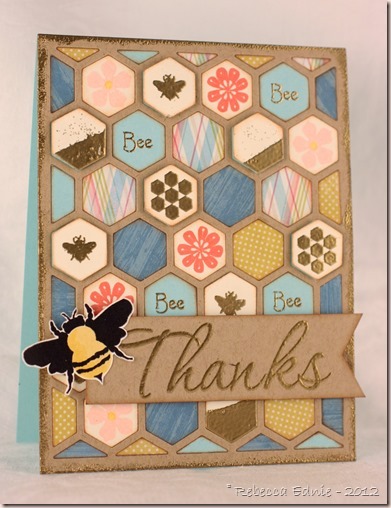 Despite that, your card is lovely and I love the bee theme and colors. This is very pretty! 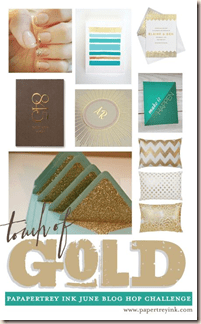 Love how you used all the gold embossing! Super cute! Love the “honeycomb”! Such a pretty fun card! Love how you arranged the designs on the hexies! love those half dipped hexies! I really like the quilts feel of this card. Very sweet. All the colours are wonderful too! Great job! This is a fun card! Love the big bee! It looks great to me, so it must be amazing in real life! Love how you used the bees with the cover plate. Very pleasing.